The routine generation of transgenic plants involves analysis of transgene integration into the host genome by means of Southern blotting. However, this technique cannot distinguish between uniformly transformed tissues and the presence of a mixture of transgenic and non-transgenic cells in the same tissue. On the other hand, the use of reporter genes often fails to accurately detect chimerical tissues because their expression can be affected by several factors, including gene silencing and plant development. So, new approaches based on the quantification of the amount of the transgene are needed urgently. We show here that chimeras are a very frequent phenomenon observed after regenerating transgenic plants. Spatial and temporal analyses of transformed tobacco and apricot plants with a quantitative, real-time PCR amplification of the neomycin phosphotransferase (nptII) transgene as well as of an internal control (β-actin), used to normalise the amount of target DNA at each reaction, allowed detection of chimeras at unexpected rates. The amount of the nptII transgene differed greatly along with the sub-cultivation period of these plants and was dependent on the localisation of the analysed leaves; being higher in roots and basal leaves, while in the apical leaves it remained at lower levels. These data demonstrate that, unlike the use of the gus marker gene, real-time PCR is a powerful tool for detection of chimeras. Although some authors have proposed a consistent, positive Southern analysis as an alternative methodology for monitoring the dissociation of chimeras, our data show that it does not provide enough proof of uniform transformation. In this work, however, real-time PCR was applied successfully to monitor the dissociation of chimeras in tobacco plants and apricot callus. We have developed a rapid and reliable method to detect and estimate the level of chimeras in transgenic tobacco and apricot plants. This method can be extended to monitor the dissociation of chimeras and the recovery of uniformly-transformed plants. Genetic engineering has emerged as a powerful tool to obtain commercial crops with improved agronomic characteristics, and in many plant transformation systems the availability of selectable markers is essential to recover transgenic plants. Genes conferring resistance to selective chemical agents, such as antibiotics and herbicides, are used routinely . However, tissues transformed with these genes and/or with those encoding for desirable traits could harbour both transformed and non-transformed cells. As a result, the regenerated plant will be a chimera for the transgenes. The problem of chimerism seems to be more frequent than originally thought and it has been reported in several herbaceous species, including tobacco , soybean , potato , rice , flax  and strawberry . Chimeras were also recovered frequently from woody fruit trees such as apple . Very high frequencies have also been reported in Citrus, for which escapes and chimeras account for 90% of regenerated lines [9, 10]. The occurrence of chimerical plants can be explained most plausibly by the multicellular origin of shoot organogenesis [11, 12]. Additionally, the development of chimeras and escapes may result from the transient expression of the marker gene during early stages of the regeneration process or the presence of persistent Agrobacterium cells in infected tissues. Chimeras may also be a consequence of the protection of non-transgenic cells by the surrounding transformed cells [10, 13] or of the ineffectiveness of selective agents in species with an endogenous tolerance . Because it is extremely important that the transgenes remain stable in time and space throughout the lifetime of the plant, chimeras should be identified and discarded or dissociated, to leave fully-transgenic plants. Several methodologies have been described to monitor the recovery of uniformly-transgenic plants. In combination with the selectable marker gene nptII, they are based on the use of reporter genes that allow selection and visual detection of transgene expression, and are used extensively to maximise transformation efficiencies. The most common are based on β-glucuronidase (GUS) staining  or green fluorescent protein (GFP) expression [4, 15]. However, these methods have serious drawbacks because gene expression can be affected by several factors, including the developmental stage of the plants. Moreover, in many plant species, GFP is hardly detectable in green tissues due to autofluorescence interference . The difficulties found with the use of these visual marker genes led some authors to suggest a consistent, positive Southern as proof of the uniformity of transformation [17, 18]. Real-time PCR has emerged as a robust methodology for biological investigations because it can detect and quantify very small amounts of specific nucleic acid sequences. It has been used widely in clinical applications, but recently it has also been reported as a useful tool for estimation of the number of integrations in transgenic plants [19, 20], determination of zygosity  and quantification of transgene expression [22, 23]. Real-time PCR detects PCR products during their accumulation. It is commonly based on either non-specific or specific reporters such as SYBR Green or TaqMan chemistry, respectively . In the former case, a probe labelled with a fluorescent reporter dye at the 5'-end and a quencher at the 3'-end is hybridised to an internal sequence between the forward and reverse PCR primers. When the probe is intact, reporter fluorescence is absorbed via fluorescent resonance energy transfer by the quencher, and no reporter fluorescence can be detected. Due to 5'-exonuclease activity of the Taq polymerase, reporter fluorescence accumulates with each successive round of amplification and can be detected. This fluorescent signal is proportional to the amount of PCR product generated and, subsequently, to the initial DNA template in the sample during the exponential phase of PCR, making it suitable for accurate quantification of the starting amounts of nucleic acid in the PCR reaction, without further analyses. We have developed a new strategy based on the use of quantitative, real-time PCR to allow quantification of the transgene in order to identify chimeras. Moreover, this quantitative method seems to be suitable for monitoring their dissociation. The method used throughout this study is based on the ΔΔCt or comparative Ct method, because it permits higher throughput than the absolute quantification method. We carried out, first, a validation experiment to demonstrate that the reaction efficiencies for the transgene and the internal control are approximately identical . Transgenic apricot and tobacco lines transformed with the binary vector pBin19-35SGusintron, and which carry the nptII gene, were obtained and their DNAs were serially diluted to obtain a standard curve for both the endogenous β-actin and nptII genes. The correlation between the Ct value and log [DNA] was around 0.99 for nptII and actin in both apricot and tobacco (Figure 1). This linear relationship indicates that a Ct value is suitable for estimation of the relative amount of the transgene. 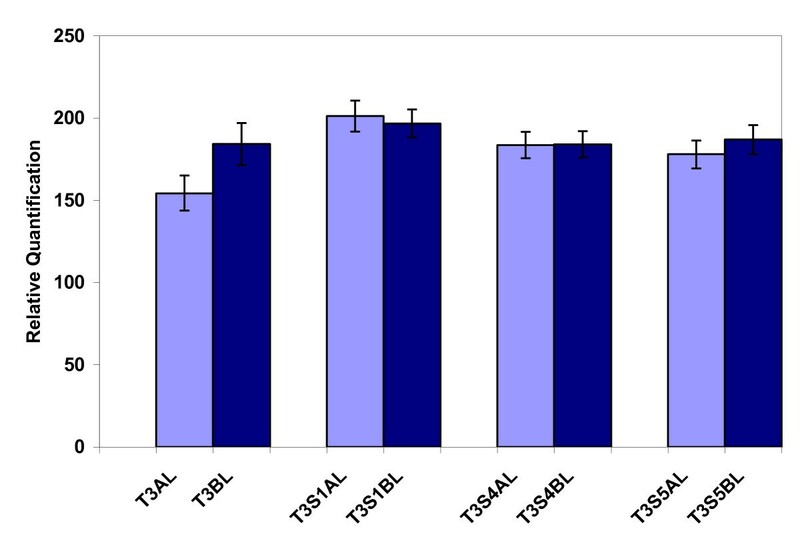 In addition, the efficiencies of amplification of the transgene and the internal control were very close (slope = -3.4 for both genes and both plant species, Figure 1) and were not significantly different from a 100% efficiency according to the statistical analysis proposed by Yuan et al. to check quality data and amplification efficiency. For apricot, when regression analyses were run individually for each DNA extraction, amplification values were Rep1: -3.47 and -3.39, Rep2: -3.43 and -3.44, Rep 3: -3.43 and -3.34. For tobacco results were similar and efficiencies for the individual regressions were Rep1: -3.46 and -3.45, Rep2: -3.46 and -3.40 Rep3: -3.47 and -3.43. Efficiency of amplification of npt II and β-actin genes in three independent DNA extractions from A) apricot callus and B) tobacco leaves, transformed uniformly, with the binary vector pBin19-35SGusintron. Both apricot callus and tobacco plants harboured one copy of the transgene. 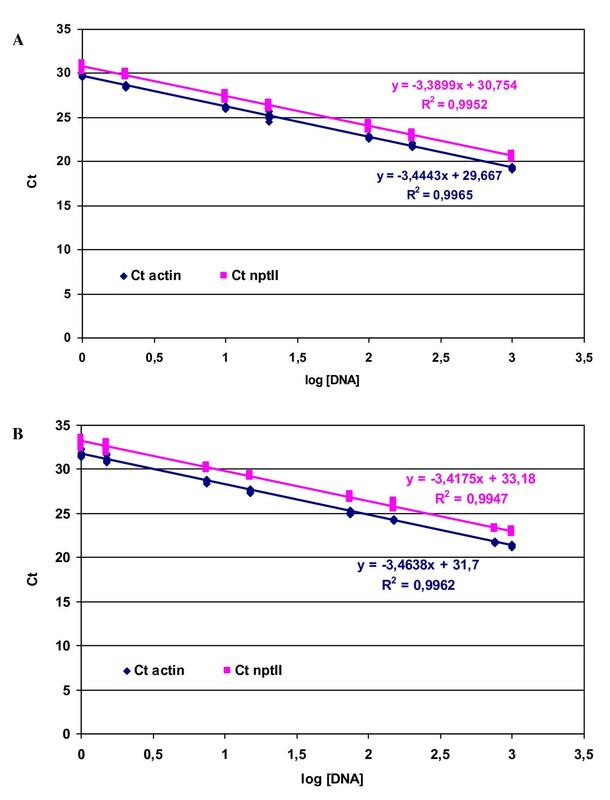 DNA samples from transgenic callus and plants were diluted serially to obtain a standard curve for both the endogenous β-actin and nptII genes and the Ct value was plotted against log [DNA]. Samples were run in three replicates of each of the three independent DNA extractions. The correlation coefficient and slope values are indicated. All Ct values obtained throughout this work are within the linear range of each target gene. The expression of visual marker genes such as gus has been used extensively to detect chimeras in order to discard them [10, 17]. However, in apricot plants, gus expression seems to be very dependent on the plant developmental stage and, although its expression is uniform and strong in young regenerated buds, it is only expressed in the petioles and veins of leaves from micro-propagated shoots (data not shown). Therefore, it is difficult to use the expression of this gene to discriminate chimerical from uniform plants, since differential expression may be found in different tissues or with plant development. To further demonstrate this point, we used tobacco, a model plant with very-well-established transformation protocols . Several lines transformed with the binary vector pBin19-35SGusintron, which carry both nptII and gus genes, were obtained and three of them were selected with different degrees of GUS staining in apical leaves of a similar age and developmental stage (Fig 2A). One line (T1) exhibited a weak GUS staining, while the other two (T2 and T3) showed uniform GUS staining. When these lines were evaluated for the relative amount of the nptII transgene using quantitative real-time PCR, a positive correlation was found between GUS staining and the amount of nptII determined in DNA extracted from the apical or basal leaves. However, the amount of transgene in DNA extracted from apical and basal leaves was significantly different in all lines (P < 0.001 in the three lines), including those in which a uniform GUS staining of the apical leaves was observed (Figure 2B). A consistently higher amount of transgenic DNA was found in basal leaves from all lines, suggesting that the three lines are chimerical. Detection of chimera in three transgenic lines (from T1 to T3) of tobacco transformed with the binary vector pBin19-35SGusintron, which carry both npt II and gus genes, using three different methods. A) Histochemical GUS staining of their apical leaves (leaf on the left is a non-transformed control). B) Determination of the relative amount of the nptII transgene, as compared with a non-transgenic control, in their apical (AL) and basal (BL) leaves using quantitative, real-time PCR. Four independent DNA extraction per line were used. C) Southern blot analysis of the nptII transgene in the apical (AL) and basal (BL) leaves of the same lines. The lane labelled (+) corresponds to the digested pBin19-35SGusintron vector. We also attempted to determine the reliability of Southern blot analysis for monitoring the uniformity of transgenic lines. When the same DNA extractions, used for real-time PCR, were digested with BamHI (with one restriction site into the T-DNA) and subjected to Southern blot analysis using nptII as a probe, differences in the pattern of insertion were not observed within the same line, whatever the position of the leaf. However, clear differences in the patterns obtained could be observed among the three lines (Figure 2C). 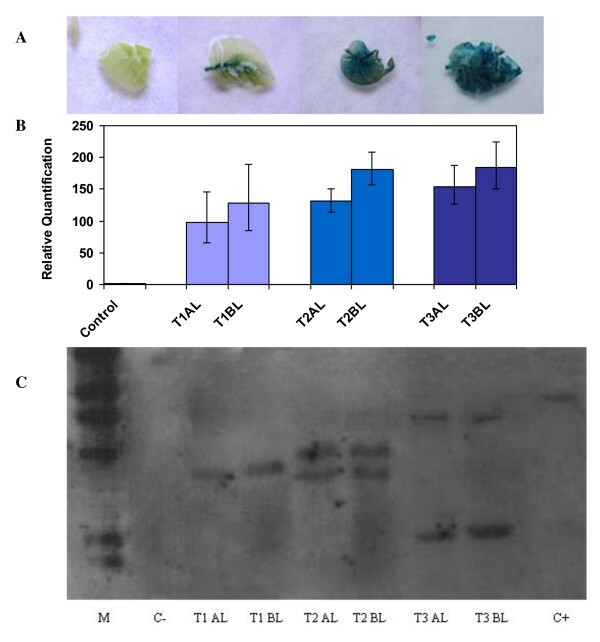 Taken together, these results indicate that regeneration of chimeras did not result only from the fusion of different transformation events, as was reported in Citrus  and cabbage , but rather from the fusion of transgenic and non-transgenic events. Other authors attempted to dissociate chimerical plants by mean of in vitro culture-based methods and used Southern hybridisation to demonstrate that the recovered transgenic tissues were uniform [17, 18]. However, our results demonstrate that a positive Southern blot signal will be obtained if the amount of transgene is over the detection threshold, but this does not necessarily mean that all, or even most, of the plant cells are transformed. Transformation experiments were also carried out with apricot plants using the pBin19-35SGusintron and several transgenic lines were regenerated . Quantification of nptII from the apricot line HN507-31, using real-time PCR, revealed that the amounts of the transgene assessed from the DNA extracted from basal and apical leaves of micro-propagated shoots were significantly different (P < 0.01, Figure 3A), indicating that this line was a chimera. In addition, when relative amount of transgene was compared between DNA extractions from roots and apical leaves of several shoots of two different apricot transgenic lines (HPinB3 and HPinAB12), significant differences (P < 0.001 and P < 0.05, respectively) were found between roots and leaves in the relative amount of transgene for both lines (Figure 3B). As with tobacco, the amount of the transgene varied greatly according to the position in the shoot, being very high in roots growing within the selective medium, intermediate in basal leaves and lower in the apical leaves. These results indicate the existence of a gradient for the strength of the antibiotic selection. The antibiotic effect is stronger in those plant parts closer to the selective medium. The chimera is then potentiated as the plant grows and the selection became weaker in distal areas of the plant, located far from the medium. Detection of chimerism in the transformed apricot lines HN507-31, HPinAB12 and HPinB3. Plants were transformed with the binary vector pBin19-35SGusintron carrying the nptII transgene for kanamycin selection. A) DNA was independently extracted from apical (AL) and basal leaves (BL) of five different shoots of the line HN507-31, and used for relative determination of the amount of nptII using quantitative, real-time PCR. 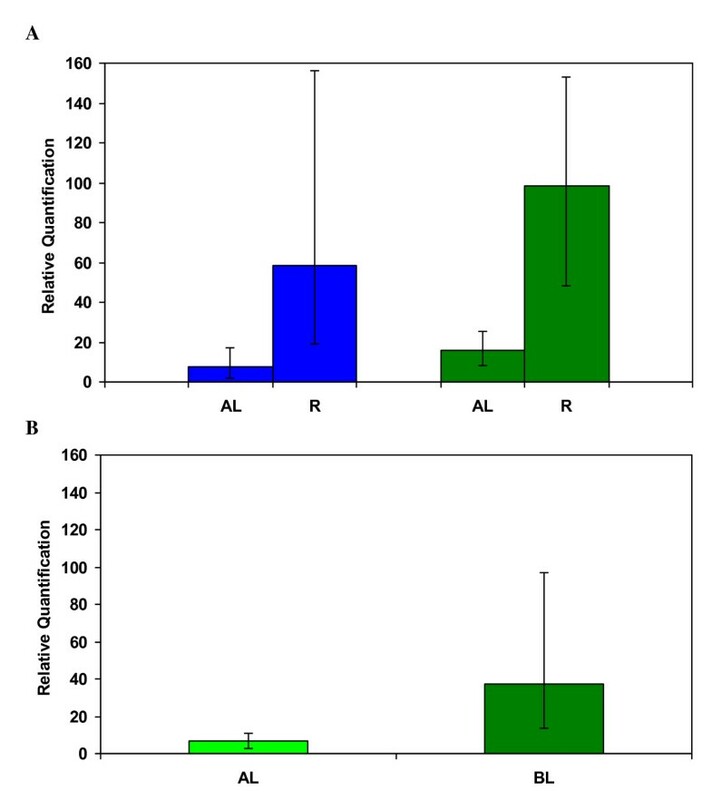 B) DNA was also independently extracted from apical leaves (AL) and from roots (R) of three different shoots of each of the transgenic lines HPinAB12 (blue) and HPinB3 (green), and used for real-time PCR. It is unlikely that this chimeras originated from different events of integration because, in most woody trees, the efficiency of transformation is very low . Transgenic chimerical line T3 in Figure 2 was multiplied in vitro by subculturing single-node explants in selective root-inducing medium. Shoots with a good rooting system and dark-green leaves were selected and maintained during 9 subcultures. Then the nptII content in apical and basal leaves was evaluated in three different shoots (Figure 4) and there were not significant differences in the nptII content between apical and basal leaves. Furthermore, there were neither significant differences between independently selected S4 and S5 shoots, indicating that dissociation of chimera occurred. Dissociation of chimera in the transgenic tobacco line T3. The chimera was divided in single-node explants and subcultured for 9 additional cycles. Then three different shoots (S1, S4 and S5) were selected because of their good rooting system and dark green leaves and their DNA was extracted from the apical (AL) and basal (BL) leaves. Values are means from four to six independent DNA extractions from each shoot (or eight to twelve from each shoot/position combination). We have compared the reliability of Southern blotting and real-time PCR with respect to following the dissociation of chimeras. 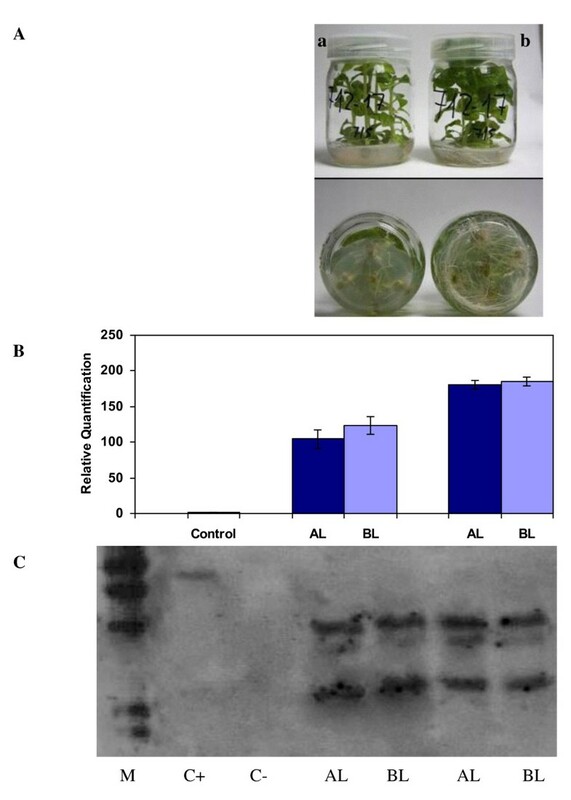 In tobacco, most chimeras can be dissociated easily by in vitro propagation on a selective, root-inducing medium and by phenotypic selection of the best micropropagated shoots (without bleaching symptoms, with a good rooting system, etc.) as shown in Figure 4. To validate this visual observation, chimerical line T17 was selected and shoots were separated, based on a phenotypic classification, into shoots with lower (T17a) and higher (T17b) rooting ability, as well as on the absence/presence, respectively, of bleaching symptoms in the leaves (Figure 5A). Real-time PCR and Southern blot analyses were carried out with DNA extracted from the apical and basal leaves of T17a and T17b shoots. The first method (Figure 5B) confirmed that T17b is transformed uniformly, as the amount of the transgene determined in the apical leaves did not differ significantly from that measured in the basal leaves, unlike T17a for which significant differences (P < 0.05) were found. Moreover, significant differences (P < 0.001) were found in the nptII content between T17a and T17b shoots. However, a consistent, positive Southern was observed in both T17a and T17b, whatever the position of the leaf (Figure 5C). This result reinforces the view that this technique is not sufficient to discriminate chimerical from uniformly-transformed plants or to monitor the dissociation of chimeras. Dissociation and Quantification of the chimerical tobacco line T17. A) Dissociation of the chimerical tobacco line T17 on rooting medium. Explants were transformed with the binary vector pBin19-35SGusintron carrying the nptII transgene for kanamycin selection and screened phenotypically. Shoots (a) in the left-hand jar were chosen for their poor root system, light green leaves and bleaching symptoms, whereas shoots (b) in the right-hand jar were found to be normal. B) Quantification of the nptII transgene from the apical (AL) and basal leaves (BL) of the shoots a and b using real-time PCR. Values are means from six biological replicates. Dissociation of chimeras was almost impossible to achieve within the whole apricot plant using in vitro micropropagation and an iterative regeneration/selection method  may be necessary. We decided to check the validity of real-time PCR for the monitoring of dissociation in transgenic apricot callus tissues. A transgenic callus line, selected randomly, was used to determine the amount of nptII after three successive rounds of sub-culture (the period of sub-culture was about one month) (Figure 6). The amount of the transgene did change significantly over this period (P < 0.05), and dissociation occurred after two months (two subculturing cycles) in selective medium. 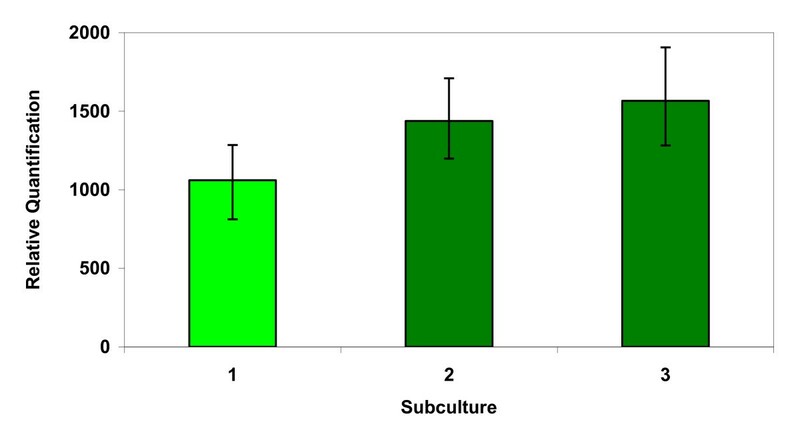 Significant differences were not observed between the last two sub-culture times, but the amount of the transgene significantly differed (P < 0.05) between callus from the third and first subculture. The easy dissociation of chimeras observed in chimerical callus could be explained by the fact that these disorganised tissues are growing in close contact with the selective medium, supporting our assumption that a gradient for the antibiotic effect exists in the entire plant. Dissociation of chimeras in apricot callus. Explants were transformed initially with the binary vector pBin19-35SGusintron carrying the nptII transgene for kanamycin selection. The transgenic line was sub-cultured three times at monthly intervals and its DNA was used for real-time PCR experiments. Values are means from three biological replicates. The methodology described here is unique in allowing a quick and easy discrimination of chimerical from uniformly-transformed plants with a very high sensitivity. This methodology is not based on gene expression, which may vary due to a number of different reasons, or to positive/negative results (as in Southern blot analysis) that may depend on the transgene amount being higher than the detection threshold of the technique. It is based on a comparison between relative amounts of transgene in several DNA extractions from the same transgenic line that should be identical in a uniformly transformed plant. Work is in progress to develop an iterative regeneration method that may allow dissociation of chimeras in apricot plants. Also, the factors affecting the initial transformation steps and selection are being optimised, to avoid the production of chimeras. Nicotiana tabacum cv. Xanthi and Prunus armeniaca cv. Helena were used as plant material. Shoots of the apricot cv. were micropropagated as described previously . Briefly, they were maintained by sub-culturing at 4-week intervals on a shoot multiplication medium, at 22 ± 1°C under cool white fluorescent tubes (55 μmol m-2 s-1), with a 16-h photoperiod. The multiplication medium consisted of QL macronutrients  and DKW micronutrients, vitamins and organic compounds , 3% sucrose and 0.7% agar (HispanLab, S.A.). The medium was supplemented with 3.1 μM N6-benzylaminopurine (BA) and 0.2 μM indole-3-butyric acid, and the pH was adjusted to 5.7 before autoclaving at 121°C for 20 min. Transformation and regeneration from leaf explants were carried out as described in Petri et al. and both transgenic plants and callus were obtained. The selective medium for callus consisted of QL macronutrients and DKW micronutrients and vitamins supplemented with 3% (w/v) sucrose, 0.7% (w/v) agar, 1 mg L-1 polyvinylpyrrolidone, 0.15% (w/v) hydrolysate of caseine, 0.2 μM BA, 4.52 μM 2,4-dichlorophenoxyacetic acid and 100 mg L-1 kanamycin. Transgenic tobacco plants were produced according to Horsch et al. . They were maintained in MS medium  supplemented with 3% (w/v) sucrose, 0.7% (w/v) agar and 75 mg L-1 kanamycin. For both apricot and tobacco plants, the A. tumefaciens strain EHA105, carrying the binary vector pBin19-35SGusintron , was used for inoculation of leaf explants. This vector harboured, in its T-DNA, nptII for aminoglycoside selection and gus for β-glucuronidase histochemical detection. NptII is under the control of the constitutive Nos promoter and terminator, whereas gus is under the control of the constitutive 35S promoter and Nos terminator. DNA was extracted from approximately 50 mg of tobacco leaves or apricot leaves and roots, one month after sub-culture, as described by Doyle and Doyle . The youngest, apical or oldest, basal leaves were used. For Southern analysis, 20 μg of genomic BamHI-digested DNA samples were separated on 1% (w/v) agarose gels and transferred to positively-charged nylon membranes by capillary blotting. The 696-bp PCR nptII fragment, amplified using the primers 5'-GATTGAACAAGATGGATTGC-3' and 5'-CCAAGCTCTTCAGCAATATC-3', was labelled with digoxigenin (DIG) using the PCR DIG Probe Synthesis Kit (Roche GmbH, Mannheim, Germany). Pre-hybridisation and hybridisation of filters to labelled probe were performed at 42°C. Blots were then washed twice at 23°C in 2× SSC (0.3 M NaCl, 0.03 M sodium citrate), 0.1% (w/v) sodium dodecyl sulphate (SDS) for 15 min, and twice at 65°C in 0.5× SSC, 0.1% SDS for 15 min. Hybridising bands were visualised with anti-DIG antibody-alkaline phosphatase and CDP-Star (Roche) on X-ray films. Detection of β-glucuronidase expression was performed on one of the youngest, apical leaves of the tobacco plants, one month after sub-culture, using X-Gluc solution . This consists of 100 mM potassium phosphate pH 8.0, 2 mM Na2EDTA, 0.1% Triton X-100, 0.5 mM potassium ferricyanide and ferrocyanide and 0.1% X-Gluc (Duchefa). Leaves were vacuum-infiltrated, incubated overnight at 37°C and chlorophyll was removed using ethanol. Primers (nptII forward 5'-ATCCATCATGGCTGATGCAATGCG-3' and nptII reverse 5'-GATGTTTCGCTTGGTGGTCGAAT-3'; apricot β-actin forward 5'-TGCCTGCCATGTAT GTTGCCATCC-3' and β-actin reverse 5'-AACAGCAAGGTCAGACGAAGGAT-3'; tobacco β-actin forward 5'-CTGGCATTGCAGATCGTATGA-3' and β-actin reverse 5'-GCGCCACCACCTTGATCTT-3') and probes (nptII 5'-TGCATACGCTTGATCCGGCTAC CT-3'; apricot β-actin 5'-TGATGGTGTGAGTCACACTGTGCCAA-3'; and tobacco β-actin 5'-AAGGAAATTACTGCTCTTGC-3') were designed on the basis of published sequences in the GenBank database, by using Primer Express software (Applied Biosystem, CA), to amplify an 80-bp amplicon of the nptII, an 140-bp amplicon of the apricot actin and 75-bp of the tobacco actin. The probe for nptII was labelled at the 5'-end with VIC as a reporter and with 6-FAM for tobacco and apricot actin. Both probes used MGB-NFQ as a quencher at their 3'-end. The PCR reactions consisted of 1× TaqMan Universal Master Mix (Applied Biosystem, CA). This contains an AmpliTaq Gold DNA polymerase, AmpErase uracyl-N-glycosylase to prevent contamination from previous PCR reactions, dNTPs, a passive dye reference (ROX), 100 nM of each specific probe, 600 nM of the specific primers (for the transgene and the internal control) and 2 μl of DNA. The reaction mixtures were made up to a final volume of 25 μl with water. Reactions were performed in 96-well reaction plates, and monitored with an ABI-PRISM 7500 Sequence Detection System (Applied Biosystem, CA). The PCR reactions for nptII and actin were run simultaneously in the same well plate. The cycling parameters were as follows: one cycle at 50°C for 2 min, one cycle at 95°C for 10 min and 40 cycles of 95°C for 15 sec (denaturation) and 60°C for 1 min (annealing and extension). Relative Quantification = 2 − Δ Δ C t Where Δ Δ C t = Δ C t ( unknown sample ) − Δ C t ( reference sample ) . The hypothesis sustaining this manuscript is that relative transgene content within a specific uniformly transformed plant or line should remain constant throughout all tissues of the plant, different shoots of one line and at different times. Therefore, there should not be significant differences when comparing the relative amount of transgene between apical and basal leaves of one transgenic shoot, different shoots or different subcultures of one transgenic line. To test uniformity of transformation, qPCR were run with, at least, three biological replicates (independent DNA extractions) from each position in the shoot and/or each shoot of a transgenic line. Each PCR was run, at least, in three technical replicates from each independent DNA extraction. Relative amount of transgene was calculated for each replicate. A linear mixed model was fitted to the normalised Ct (ΔΔCt) where shoots and/or position in the plant and/or subculture time are considered fixed factorial effects, and biological replicates a random effect within each shoot-position combination. When a fixed factor was significant (P < 0.05) the transgenic line was classified as a chimera. Mean relative quantification and 95% confidence intervals are shown in all figures for easier interpretation of results. For the validation experiment, 7 dilutions were performed for each of three biological replicates (three independent DNA extractions), from uniformly-transformed tobacco and apricot tissues with only one copy of the transgene, and reactions were run in three replicates from each dilution. This work was supported by BIOCARM BIO-AGR07/04-0011 and CICYT AGL2006-01743/AGR. M. Faize was supported by a "Ramón & Cajal" contract from the Spanish Ministry of Education. We are deeply grateful to S. Lopez Noguera, I. M. Gonzalez-Padilla and C.G. Almodovar for providing some of the transgenic lines used in this study, to Dr. David Walker for critical review of the manuscript as well as to anonymous reviewers and Dr. Emilio Carbonell for advices about statistical analyses. MF and LF were involved in the transformation experiments, performed histochemical GUS staining and carried out real-time PCR, Southern blot analyses and data analyses. LB conceived the idea of using real-time PCR to discriminate chimeras, performed transformation experiments and was responsible for the coordination of the study and statistical analyses. All the authors participated in the design of the experiments and approved this version of the manuscript.